For instance, a baby, crying for hours yet ignored, eventually accepts the fact that he is alone and deserted. He accepts this fate as "the way it is" and begins life without energy or interest. Sufferers often appear as the walking dead - exhibiting no interest or enthusiasm for life, but accepting their fate with a miserable resignation. They often speak in a flat, lifeless voice and fail to understand why others show interest in life. These people are boring company - uninterested and uninteresting. Their deep depression creates an apathy that casts a pall over every gathering. 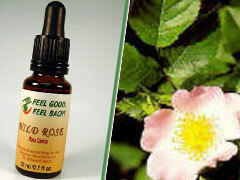 While generally a chronic state of being, the negative Wild Rose state can sometimes occur as a temporary condition. This might occur after a miscarriage, during psychotherapy, or during a phase of intense work on one's personality. During these times, this Bach Flower Essence will help the person return to their normal states of energy and enthusiasm. Treatment with this Bach Flower Essence leads gradually to a new interest in life, and the joyful expectation of better things to come. The patient gains a new flexibility and inner freedom and is once again able to let the riches of life flow through him. In essence, he "comes back to life."